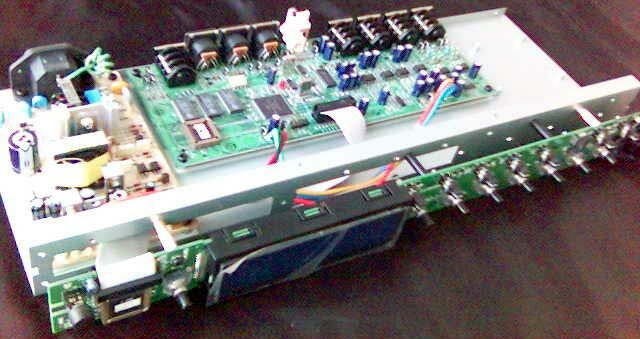 This page is intended to collect informations about the discontinued digital multiband compressor "Triple-C" by TCelectronics. Most of them are just taken from the TC-tech-library, others are found out by myself. Topics covered by the user's manual will not be repeated here. The filters used for the X-Overs are 1st order, 6dB/octave. The Threshold-Value of the Softlimiter is fixed at -3dBFS. In the I/O-Menu there is an expander to be switched on or off. Its parameters are as follows. There are two additional menus. Both of them are activated at power-on by holding down some keys. When activated they will enlighten all available items on the LCD and show a more detailed information about the device's version. Menuitems are reached by turning the value-wheel and activated using the "menu"-button. To leave switch power off. Attention: Be really careful as you might do bad things here...! The powerswitch is a "standby"-switch as it does not turn off mains. At each power-on the last preset is recalled but as well the current position of all the frontpanel-knobs is read and reactivated. If you use a default preset be sure to recall it every time after powering on! If you keep the powerswitch in its on-position and turn on and off power externally the Triple-C will initially load the preset that was loaded last time the local power switch was used to turn it off (and then read the actual knob values). When dialing the Input-Level there is a slight crackle at the +6dB-Position. As shown below there are some issues concerning the processing delays. The first is more a feature than a bug: If LookAhead is enabled and the unit is bypassed, the delay stays at above 4 ms. Thus comparing the processing result gets better as the delay does not jump at every press of "bypass". What does the DRG do? To put it short: it adds distortion of the first harmonic and slightly increases the level. measurements have been made using 1kHz sine wave, all results are just examples as the behaviour seems to change depending on the absolute level! All information on this page is to be used at own risk. I do not take any responsibility for any damage or malfunction. This is a prviate page without any commercial interest. In conformity with the german law I hereby declare that I'm not to be held responsible for any webpages or their content that might be found by following any links on this page. All registered trademarks - most likely something like TC, Triple-C - are to be treated as marked so even if they aren't explicitely.